With India’s widely inherent economic disparity, it becomes utterly imperative for assets like vehicles to be accessible to the masses in today’s fast-moving times with roadways being constructed at every stop. Many buyers in India thus take monetary value as a primary variable in their decision-making process of buying a vehicle. This article will attempt to inform readers of some of the cars that fit this description without compromising on the other essentials and luxuries. It is not without merit that the Alto 800 is one of the most-selling hatchbacks in India. The car has an admirable mileage of 24.7-33.4km/kg with a 0.8L, 47.3bhp engine available in petrol and CNG variants. The car is a 5-seater and only has manual transmission. The interior is nice and spacious with an integrated stereo, a keyless entry option, plenty of storage space, front and rear console bottle holders and power windows. Safety has been taken care of by driver-side airbags and seatbelts at the backseats. The exterior is sturdy and aerodynamic with stylish headlights and fog lamps. The Kwid dons an exclusive quasi-SUV look whilst being a subcompact car but its worth noting that the car rightfully appeals to the adventurous as it provides some exceptional features for its class. The Kwid has a fantastic fuel economy of 23-25 km/L and has a lasting fuel tank capacity of 28L. The people who constantly need to quench their thirst for adventure wont back down from it, as it proves worthy of a challenge with a high ground clearance of 180mm and best-in-class boot space of 300L. The Kwid also fulfils safety standards by having driver airbags, Anti-lock Braking system and a seat belt and overspeed alert. 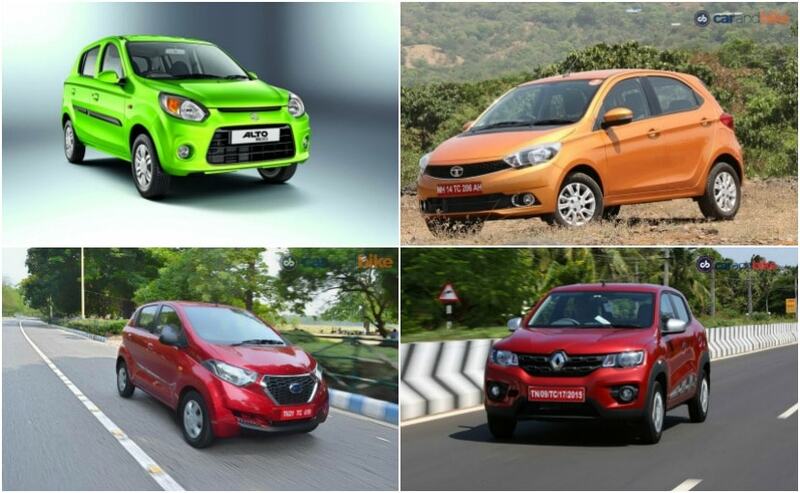 This city car is quickly becoming the face of every average Indian’s choice and one of the cheapest too with some of the best in class features and some more! The car is available in 0.8L and 1L petrol variants with automatic and manual transmission, it provides a decent mileage of 23km/L with a 28L fuel tank. The car has the standard ABS and driver airbags with a new brake and suspension system. The most reassuring thing about Datsun is also the fact that the company provides impeccable service and 24×7 roadside coverage. The model which had taken the Indian market by storm when it was first released has now seen considerable improvements from its predecessor and is now looking strong again in its department. The renovated 4-seater has an all-new 2-cylinder Gasoline engine with a new Automated Manual Transmission and a fuel tank capacity of 24L. It gives a solid mileage of 21.9-23.6kmpl and has dual-tone interiors with comfortable seats. The is also fitted with a revised set of headlights in the front making it look chicer than ever.